The Cabinet of Swaziland / Eswatini gave King Mswati III a ‘luxurious lounge suite trimmed with gold’ as a gift for his 50th birthday. The absolute monarch also received cheques worth at least E5 million (US$400,000). The King’s subjects had been encouraged to deliver gifts to him at Lozitha, one of his 13 palaces, on Monday (4 June 2018). They were to mark his 50th birthday that fell on 19 Aril 2018. On that day he wore a watch worth US$1.6 million and a suit weighing 6 kg studded with diamonds. Days earlier he had taken delivery of his second private jet. This one, an Airbus A340, cost US$13.2 to purchase but with VIP upgrades was estimated to have cost US$30 million. Meanwhile, seven in ten of the 1.1 million population live in abject poverty with incomes less than the equivalent of US$2 per day. Both of Swaziland’s daily newspapers reported the presentations. 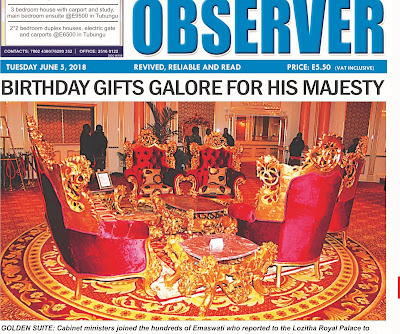 The Swazi Observer, a newspaper in effect owned by the King, dominated its front page with a picture of the lounge suite presented by the Cabinet. In Swaziland political parties are banned from taking part in elections and the Prime Minister and the Cabinet are hand-picked by the King. The newspaper did not disclose the cost of the suite ‘trimmed with gold’, nor did it say if it had been bought out of public funds or from personal donations by Cabinet members. The Observer also published two pages of pictures of presentations to the King. It reported that MTN Swaziland (until recently the monopoly supplier of cell phone services in the kingdom) presented him with a cheque for E1.1 million; Macmillan Education Publishers (which supplies many schools in Swaziland) gave E394,000 and Build It gave E205,000. 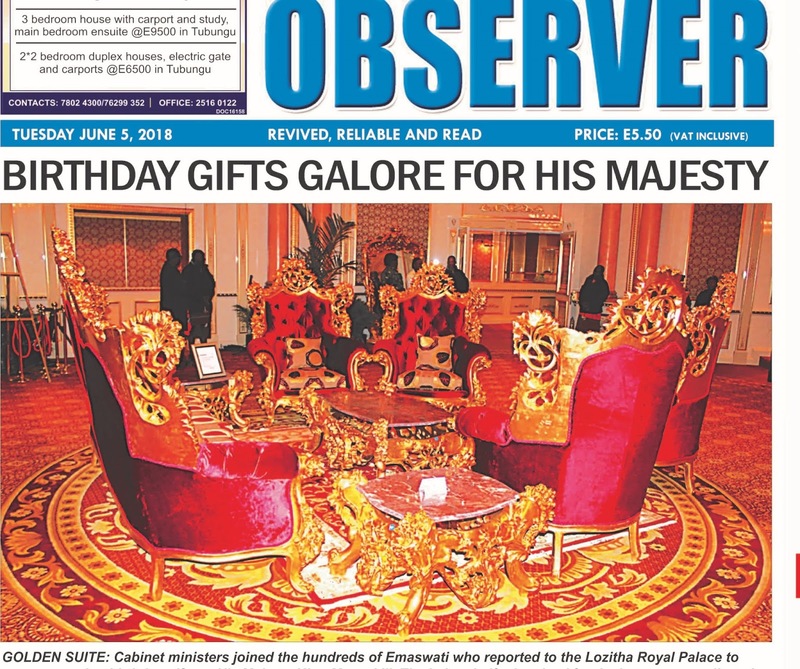 The Observer estimated the King received cheques worth at least E5 million in total towards his birthday celebration which also marked the 50th anniversary of Swaziland’s independence from Great Britain. The Times of Swaziland reported people ‘from all age groups, the youngest being a six-year-old, while the eldest was 75 years old’ went to the palace to ‘shower’ the King with gifts.